The first room you enter from the front of our house is The Long Room. But we never use it that way. In my grandmother’s day, the front door was never opened. You see, in 1952, ten years after she and her young family moved to Clifton on the Monocacy, with its fields stretching behind the house, down to the Monocacy River, and its tree-filled front lawn creating a foreground for its spectacular mountain view, a cement factory was built DIRECTLY across the road from her front door. Not only did this factory block her view, it blighted the bucolic landscape and belched an insidious, fine grey dust over everything. She removed her comfortable chairs from the front porch, closed the front door, and never used it again. When I was a little girl, a chair sat in front of the door, as if it were a wall. So The Long Room became a room at the back of the house, the last room you entered before heading upstairs. It was a hallway, but it was no longer central to the house. Thus this long room, big enough to accommodate high school dance parties hosted by my father and uncle in the 1950s, became a forgotten room. 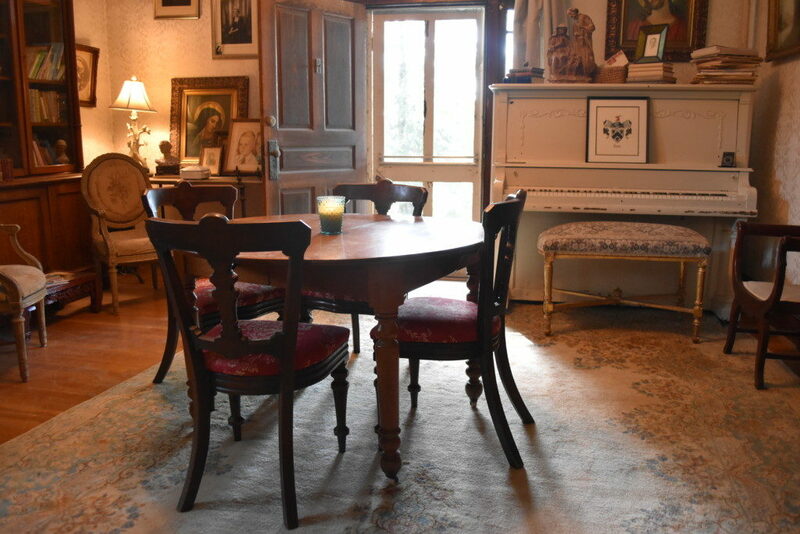 In here, grandmother would house her favorite, delicate things: a blue velvet ‘square’ chair, her German porcelain candelabra, books, a grand piano (which neither she nor my grandfather could play). It was lovely, comfortable, as was everything my grandmother put her finger to, but it was also a room of unnecessary things. But the one activity that consistently brought the entire household into this room was when my sisters, my cousin, and I would put on our theatrics. They were always staged on the first landing of the front stairs, a perfectly sized stage for four young thespians. These were sophisticated affairs which included original scripts (written and directed by us), costumes (items found in closets), and elaborate props (the piano stool as a dining table, a jump rope as a microphone). Popular songs of the day were usually included, a cappello. Our audience was always appreciative, and left us feeling remarkably talented. And just a note on this room, that I realize only as I write this: this was a room filled with finer things, items my grandmother held in esteem. And yet we were never made to feel that we could not be in there. We sought out the room for our games and fun. 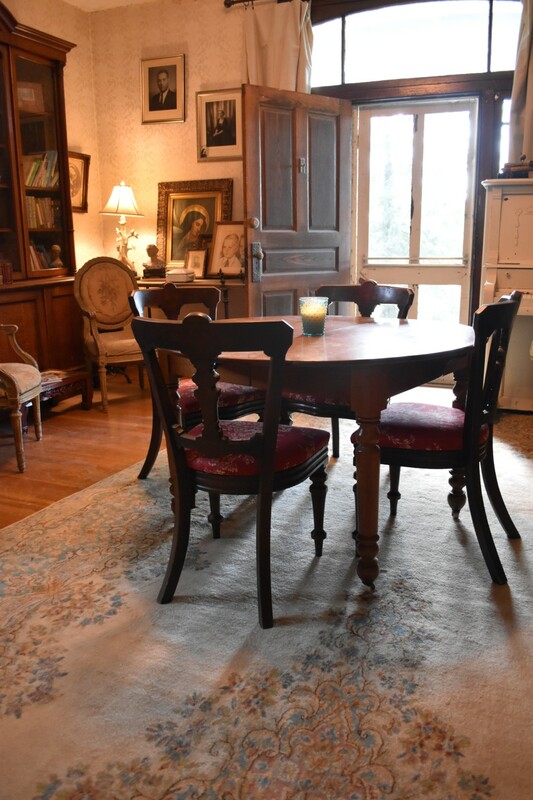 To this day, when we set the ‘young people’s table’ for our big get-togethers, that table is set in The Long Room, on its deep, wool oriental rug. That’s just how it was. So consider Grandmother Thomas’ example when you get the impulse to say that a certain room is off-limits to children. Consider what you may be denying them, and yourself. Looking toward the front door. The table is from Chip’s great-grandparents, and supports up to three large leaves, making it perfect as our second dining table for our big holiday feasts. The chairs are a gift from my parents. My mother acquired them in the 70s, but they date back to the Civil War era. I recovered them in a Waverly toile when we first moved here in 2001. The piano is not used often enough, but I dearly love to play when I get the chance. The bench is a gilded frame a found somewhere, and upholstered in a vintage textile from Hungary, which I found at the huge Round Top, Texas antiques market about eight years ago. Moving south (toward Buckeystown) from the front door, you see the widest use-able space in the room. 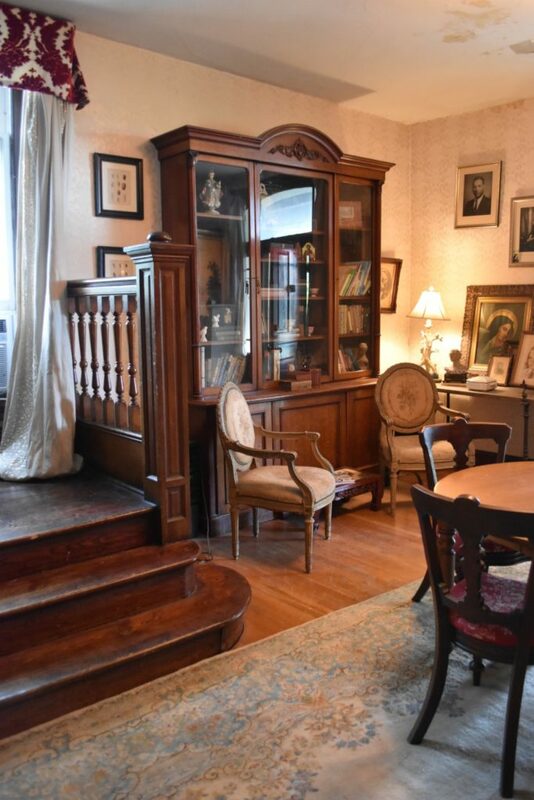 This is where my grandmother had one and a half walls of book cases, with a baby grand piano in the center, and a gallery of pictures above on the walls. I found this stunning European bookcase, with all its original brass keys, in a tent in one of the many fields that comprise the Round Top, Texas antiques week. The minute I saw the piece, I knew exactly where it belonged. We keep games in the bottom, books and beloved objects in the top. The french chairs are another gift from my parents – really from my mother, who has a near-fetish level of love for chairs. This sickness she has passed on to me, along with some of her favorite indulgences. These chairs have their original needlepoint upholstery – over 100 years later. Finally you see the ‘stage’, with its curved steps and imposing columns, leading to the second floor. Continuing along the south wall, the stairs consume a large portion of the room. 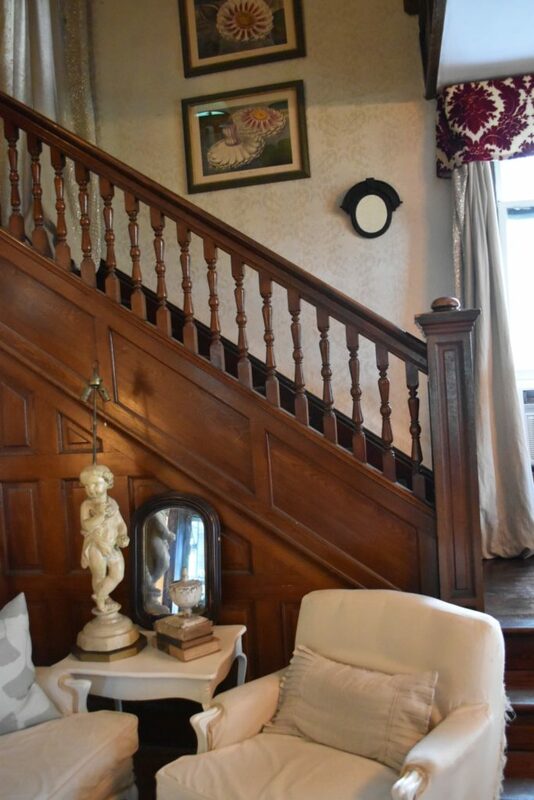 The carving and detailing on the ballisters, newel posts and paneled wall are exceptional. Chip is convinced that this should all remain unpainted wood. But I keep arguing that the room will be so beautifully lightened by painting it, and that the workmanship and detailing will be so much better displayed if painted . . . On the wall going up the stairs is a pair of late 19th/early 20th century colored lithographs of Victoria waterlilies. These images, found by the amazing girls at Silk & Burlap were acquired fewer than 5 years ago, yet they speak to my family’s history as owners of Lilypons Water Gardens, and my early professional life spent their creating catalogs and producing special events. With the next installment we’ll finish up this largest room in the house, and I’ll share with you my inspiration for freshening the space. I have always been curious about the interior of that house. You have not only satisfied that curiosity by way of your photos but brought it to life by sharing your precious memories! What a treat!!! Virginia, this is the beginning of a novel. Definitely keep telling this story. I want to know everything! That story about the front door closing and never opening again, and the belching factory. My heart cries for your grandma, but am not at all surprised that she found a workaround. She sounds like she was just wonderful. And your Mom… good grief! So striking!! xo Hurry hurry with the next chapter. And don’t forget to talk about the lighting and oh my gosh, I love all your chairs and THAT RUG!!! That’s everything! After seeing the first part of the tour, I kept thinking about the closet under the stairs, and the games and toys. It is indeed a magical part of this very special room. I was never around for George and Charlie’s dance parties, but I sure remember the family gatherings for almost any kind of occasion, as well as the Sunday afternoon visits, when the adults (your grandparents and my parents) sat around the square room, and the kids found all manner of things to do. At some point, you grandmother would go out to the kitchen, pop into the pantry, and throw together something delightful for lunch in the dining room. She was amazing that way! Everything she did felt effortless, like she had little elves doing the work at her bidding. Her kitchen was pretty magical too, especially when she was baking . . .
It’s been a pleasure, CB. Thanks so much for reading! Your lovely words and descriptions of these beautiful rooms and the memories you have shared allowed me to recall my own fond memories of my grandparents home in North Carolina also located along a river. Our visits there on summer evenings playing on the large wrap around porch and the those special rooms on the inside are priceless. Sharing these photos and the history of your own childhood and favorite memories will be treasured forever by your family. Thank you!!! Thank you, Laura. There’s nothing like childhood memories, and having wonderful grandparents. Great to hear from you, Amy! 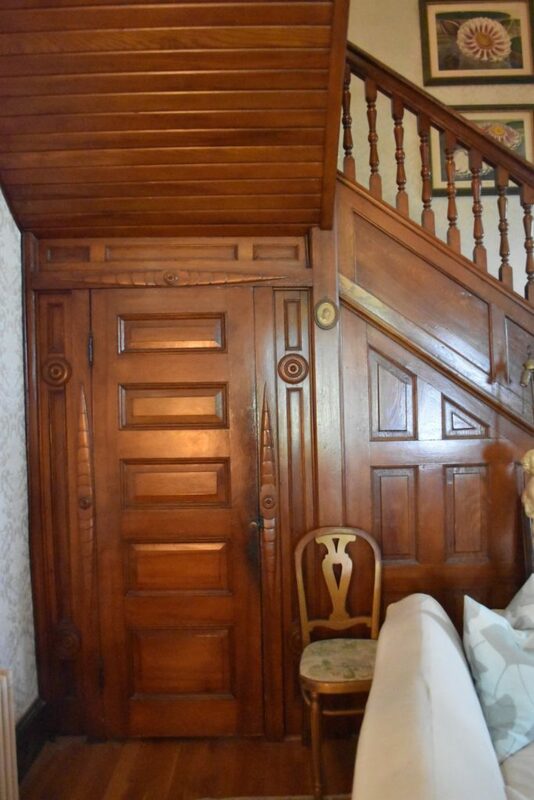 I enjoyed closet under stairs in our parents Victorian house. We played inside closet where we put coats and shoes in. We did, too! It was like the wardrobe from Narnia: if you pushed through the curtain of coats, you found yourself in this wonderfully secret, and small space beyond, where only we children could really go. Just magical, really.